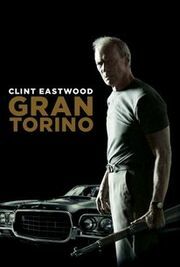 In a crime-ridden Detroit neighborhood, that has converted a white working-class neighborhood into an Asian (Hmong) enclave, a grumpy and recently widowed old Korean War veteran and hold-out Walt Kowalski (Clint Eastwood) confronts a troubled Hmong teen attempting to steal his prized Gran Torino: the car that represents his happier days working on the Ford assembly line. Walt is dealing with lingering resentments, a willingness to hurl racist epithets, and yet the old dog is willing to learn new tricks, and expose his humanity to those that treat others well and a community that treats the elderly with a certain respect. And he shows everyone what it means to protect your country and community from wrong-doers: while being wise enough to know the difference between little wrongs and big wrongs. It's touching, a little slow, but has a great message, and I feel like a better person for loving the film. This page was last edited on 13 January 2019, at 23:24.